Leading motherboard, graphics card and computer peripherals maker MSI has expanded its Gaming catalogue with its first Mechanical Gaming Keyboard. Built on the popular Cherry MX Red linear switches, the MSI GK-601 provides superb feedback and sensitive key responsiveness. In order to deliver the highest quality standards in keyboards, each key on the MSI GK-601 is created with precision laser etching for extra resistance to wear and uses 18K gold plating to increase the stability while N-key rollover makes sure that every key-press registers. A rare yellow LED backlights the each individual key even after 50 Million key presses (per key) making them excellent for use at during day and night. With a massive 128KB of memory, 50 different macros can be stored to help you out in any gaming situation and high speed USB ports and Audio and Microphone jacks making this THE keyboard every gamer needs. Otherwise, MSI also releases Classic series Keyboard with Cherry MX Red linear switches and ergonomic design which brings the best experience for office or general users. All keys and connectors are 18K gold plated and use military-grade close-woven wiring. This drastically increases the durability and lifetime of the keys and ensures there is no signal corruption thus improving latencies leading to faster controls. A very important detail, the Windows button can be disabled to prevent in-game interruptions due to accidental key presses. This prevents tons of frustration or difficult system hacks to disable this Windows function. The use of high-end USB N-key Rollover technology ensures immunity to key ghosting and blocking. Finally, a set of Multimedia hotkeys allow for quick volume adjustments and playback control. The MSI GK-601 uses a relatively rare backlight technique consisting of yellow LED with four levels of brightness. This helps gamers see every key in the dark and make their moves with ease. The breathing lights function adds a layer of mystery and tension. Precision laser etching and rigorous testing ensures that every key cap can withstand the relentless pounding of gamers without becoming worn or faded. 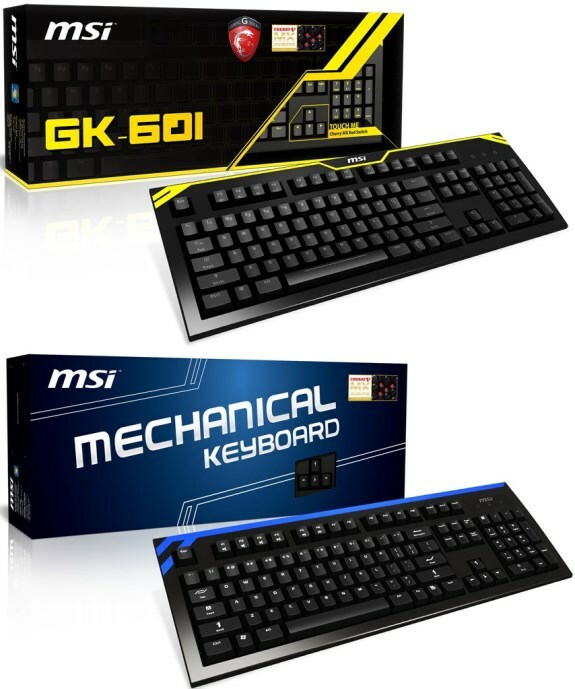 The MSI GK-601 is laid out with the world standard 104-key layout. The ergonomic and rugged key press structure prevents player discomfort even after extended use. The MSI GK-601 also features highlighted WASD keys, two high-speed USB ports, audio out and microphone jacks and anti-skid feet. The high quality, convenience and expandability is your final destination in the quest for the best possible gaming keyboard!